The world is officially going to hell in a hand-basket. How do I know this? 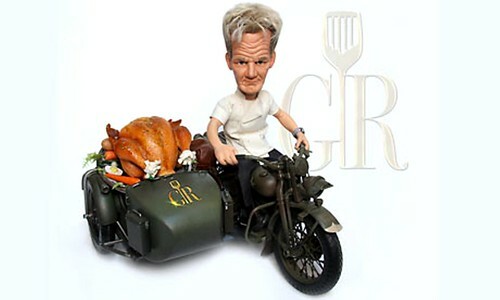 I've just discovered that Gordon Ramsay, who is already a fairly complete caricature of a human being, is being turned into an actual cartoon, or rather a stop-motion animation. The show is called Gordon Ramsay, At Your Service (I'm having flashbacks of You Rang, M'Lord) and was being touted for sale by Canadian animation house Cuppa Coffee Studios this week at the Mipcom international TV sales convention. Cuppa Coffee Studios (makers of the notorious Celebrity Deathmatch) say that Gordon Ramsay, At Your Service will "take the essence of who [Ramsay] is and have a bit of fun with it". Mipcom is over now. This means someone might have bought it. Whoa, that's a bit too much. I'm no fan of GR anyway, but the idea of him as 1 Fat Lady in animation form is frankly terrifying. Or is the sidecar etc. window dressing? Yeesh, it's Sunday, I'm going to Church for the first time in 30 years and hoping that my faltering faith will be rekindled enough for my prayers to keep this from British TV. He's had his corrugations smoothed out now, so all his animated heads will need to be changed! @Josordoni - He looks like Max Headroom now.